Foodista | Could Insects Be The Next Food Revolution? It's a sad fact that humanity is fast outgrowing our available resources. And with almost all of the available land that's able to grow crops already taken up, science is turning to other methods to supply our food needs. One article found on The Mirror, brings to light the efforts of the British Government, (as well as several other European countries) to introduce edible insects and insect derived products as a staple of their citizen's diets in the coming years. Consumption of meat has increased world-wide by about twenty-fold in the last forty years, and it's only set to increase further as developing nations continue to grow and demand rises. This increase also makes it harder to raise any more livestock, due to the main ingredient in most kinds of feed, Soya, exploding upward in price. 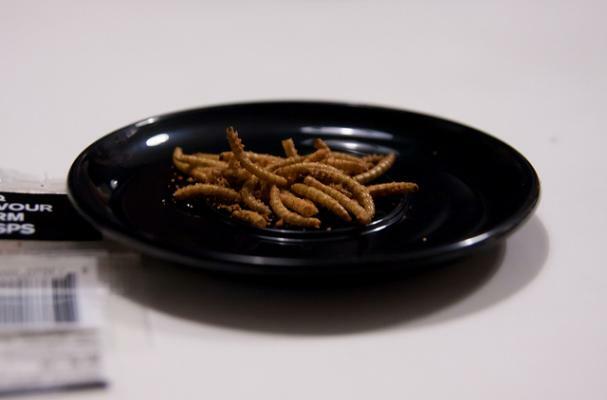 The scientists at the PROteINSECT maggot lab at the Food and Environment Research Agency, are trying to find solutions to world food shortages through insect consumption. The scientists behind this plan are quick to point out that insects require far less food to produce the same amount of edible material, as well as needing far, far less space then traditional cattle or pig farms. Think there is no way you would scoop up a spoonful of maggots? There are many ways to consume insects that are, shall we say, more creative? How about insect flour that can be made into recognizable foods like tortillas? That's what Big Cricket Farm in Ohio is doing. They are working with an insect food start-up out of Boston, Six Foods, to blend ground crickets into a flour and turning them into a type of chip called a "chirp". They even have a Kickstarter Page. Let's just face the facts; we are facing a looming food shortage, and eating insects is a thing. Let's support those creative foodies who are at least trying to make the insect look less like a bug and more like a tortilla chip. For more on the original article from The Mirror, see: Insects: Food Of The Future?